Hammertoe, or contracted toe, refers to the physical deformity of the second, third, or fourth digits of the foot. Hammertoe is found to more frequently occur within the proximal interphalangeal joint, which is the middle joint of the toe or the joint that is closest to the rest of the foot. This joint can become misshapen and permanently bent downward. As a result, the toes can look curled, like a claw, or even bulge over the top of the toenail, rather than lay flat. If left untreated, over time the interphalangeal joints of the first and last toes may begin to hyperextend or bend upward. 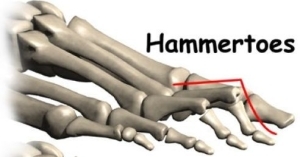 Individuals with hammertoe deformities also are at risk for pressure points located both on the ball of the foot, as well as on top of the interphalangeal joint. 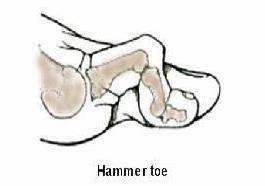 Further, hammertoes may begin to overlap or tuck under neighboring toes. The friction caused between a hammertoe and another toe can cause exotosis, or bone spurs, to form in the area. Hammertoe deformities can be quite painful for the individual, particularly from the pressure applied when wearing shoes. Hammertoe is reported to be the most common deformity occurring in the smaller toes. There is very little known about the incidence and prevalence of hammertoe deformities; however, it is found to occur more frequently among individuals whose second toe is longer than their big toe. There is some genetic risk for developing hammertoe. As mentioned above, individuals who have a condition known as Morton foot, where their second toe is longer than the first, are at an augmented risk for developing hammertoe. Individuals who have high arches or flat feet are also more likely to develop hammertoe deformities. Other conditions can increase an individual’s risk for this deformity. For instance, individuals are more likely to develop hammertoe if they suffer from rheumatoid arthritis, diabetes, or other abnormalities in the mechanics of the foot that have resulted in nerve and muscle damage. Hammertoe is also more likely to occur with advancing age. One common cause of hammertoe is related to wearing high-heeled style shoes or overly narrow shoes that crowd the toes. The muscles of the toes work in pairs in order to achieve straightening and bending movements of the joints in the toe. When the toes are compressed, bent, and held in that position for an extended period of time, the muscles can become tight from inactivity. Thus, even when the person is not wearing tight, constricting shoes, the muscles of the toe are too stiff to allow the toe to properly straighten. This is known as a muscle/tendon imbalance. Some previous findings have found that deformed toes of hammertoe tended to have higher rates of reported trauma. To diagnose hammertoe, your physician will complete a physical examination. They will examine the shape of the deformity and look for signs of corns, callouses, or other sores. The physician will also note any soreness or pain with joint movement, along with the degree of joint stiffness. Along with a physical examination, your physician may want to do an X-ray of the affected toes. Typically, this is done with the foot bearing weight to give the physician the best angle to properly assess the joints. Your physician will also check the X-ray for bone enlargements, such as exostoses or bone spurs. Instances of hammertoe that are asymptomatic, meaning that the individual is not currently reporting pain associated with the deformity, and still relatively flexible generally do not require treatment. For mild cases of hammertoe, wearing shoes with a low heel and open toes or shoes that are wider to prevent the toes from becoming compressed, can provide significant relief from discomfort and pain. Physical therapy may also be recommended to patients with hammertoe. Patients are instructed on different exercises that passively stretch the tight muscles, connective tissue, and joints of the toe. These exercises also strengthen the muscles of the foot to provided additional relief from pain. Taping or strapping the affected toe may also help repair the deformity. Hammertoe patients who have difficulty with areas of thickening skin (such as corns or callouses) on the foot may require periodic debridement, or trimming, from a podiatrist. In considering surgical correction for hammertoe, it should be noted that the goal of this procedure is to provide the patient with relief from symptoms of pain and discomfort. Surgical correction of hammertoe is not intended to improve appearance. Hammertoe is a physical deformity of the proximal interphalangeal joint within the second, third, or fourth toe. This causes the joint to remain bent, giving the toe a claw-like appearance. Several genetic factors are known to place an individual at risk for developing hammertoe, including Morton foot. Hammertoe can also be caused by frequently wearing high-heeled, narrow, or ill-fitting shoes. Asymptomatic cases of hammertoe may not require treatment. For cases of hammertoe that exhibit pain and discomfort, there are a number of treatment options available. These treatments can range from physical therapy and targeted exercises, to surgical correction of the deformity. It is recommended that you speak with your physician about the risks and benefits of treatment for hammertoe. Skaribas IM, Washburn SN. Successful treatment of charcot-marie-tooth chronic pain with spinal cord stimulation: a case study. Neuromodulation : journal of the International Neuromodulation Society. 2010;13(3):224-228. 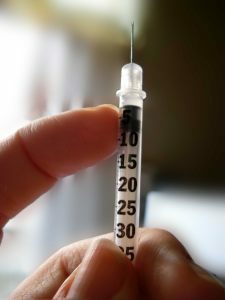 Bottger E, Diehlmann K. [Selected interventional methods for the treatment of chronic pain: Part 1: peripheral nerve block and sympathetic block]. Der Anaesthesist. 2011;60(5):479-491.